Hopefully yours, Connie: Women with Infertility: We're Everywhere! 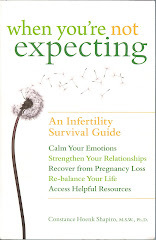 In the last month since the publication of my book When You're Not Expecting, I've been amazed at the number of women who have confided in me their personal stories of infertility: women I know well, women I know only slightly, and women I am meeting for the first time. For some, their infertility is recent. For others their infertility is an indelible part of their past. Yet all of these women told me (even as their eyes filled or their voices trembled) how emotionally isolated their infertility made them feel. In addition to the women who had been diagnosed with infertility, another group of women sought me out after reading my book. These women were students, colleagues, reporters, friends, health care professionals, former college classmates, and relatives, all of whom had read my book and wanted my thoughts on how they could be more sensitive to women who have shared news of their infertility. So here's the dilemma -- how can these two quite different groups come together to have a compassionate conversation about the emotional challenges of infertility? It seems to me there are several barriers we need to address: defining what is infertility, clarifying what behaviors are supportive, and shifting the conversation's focus as the infertile person's circumstances change. So when you share with friends, co-workers or loved ones that you are grappling with the sadness of infertility, they may not grasp that your circumstances fall within their definition of infertility. Broadening infertility to include pregnancy loss, a partner's diagnosis or secondary infertility will help others more fully to appreciate the sadness and frustration of your current situation. Defining infertility may also involve being clear about the treatments that you/your partner are pursuing. Most fertile people are out-of-the-loop when reproductive technology is the topic under discussion. They may believe that IVF can be affordable and effective for everyone, that adoption "cures" infertility, that taking a vacation is a recommended clinical cure...you get the picture. It will fall to you to be as informative as possible, without offering so much information at once that you confuse your listener. That includes correcting misconceptions, as well as offering educational information about where you are in the diagnostic/treatment process. A second barrier that may stand between you and a compassionate response is uncertainty about how to respond to your news. Especially around information that is perceived as having a sexual component, listeners are cautious about violating your privacy. This is the time to thank them for being interested in your infertility, to offer to answer any questions, and to suggest ways that they could be helpful now that you have shared this news with them. Depending on whether the person is your boss or your sister, there may be a necessity to have you clarify what you need from this person at this time in your life. And that brings us to the question about how to handle infertility and your relationships over time. For starters, you are learning as you go along who you can count on for what. 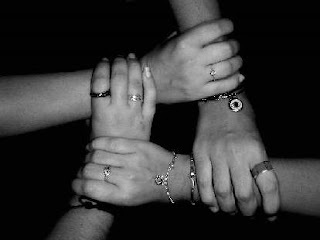 Some friends who are great for certain forms of support won't want to offer other forms of support; some who are compassionate early on will get tired or emotionally disconnected over time; some will find their own lives consumed by the joys of their own fertility and feel awkward around you; some will be there for you through thick and thin. In anticipation of this, you'll want to do several things to keep your support system resilient. Remember to relate to your friends as they've been relating to you: offer help when they need it, keep the flow of information about both of your lives, and allow them to distract you from your infertility whenever you're receptive. Try not to have your infertility define you in the eyes of others. Express appreciation when they inquire about diagnosis/treatment/waiting/etc., but feel free to turn the topic of conversation away from your infertility to another aspect of your life. Of course, if you've just gotten your period, a discouraging test result, a baby shower invitation, or other news where you need a sympathetic ear, you are entitled to ask for support. But every inquiry needn't turn into a major dialogue about your infertility. Even though you feel as if your life revolves around appointments, injections, mood swings, medications, etc., do what you can to plan with your partner, friends and loved ones some distractions that you can look forward to: a spring picnic, a new restaurant, a walk in the woods, a weekend out of town, a potluck dinner, a birthday party...you get the picture! Try to cultivate relationships with infertile friends. These folks won't need much prompting to understand why you are bummed out with a particular piece of medical news or the poor outcome of a medical procedure. In addition, adding to your friends adoptive parents and couples who are childfree by choice will expand your awareness of options these couples have pursued in their lives, perhaps with infertility as a backdrop. As time passes and you find yourself and your partner facing new decisions about future options, consider which acquaintances may be most helpful in talking about possible new directions. Some will be more helpful than others, and you may want to think about this before asking them to weigh in with their reactions to new choices that you are facing. So, as we know that infertility affects far more people than would initially be apparent to us, and as we realize that many people are silent or awkward because they need a little help to know how they can help, I hope you can envision yourself reaching out in new ways to people who have the capacity to be supportive, both emotionally and practically. Feel free to weigh in with strategies you have used to generate support from people in your life!